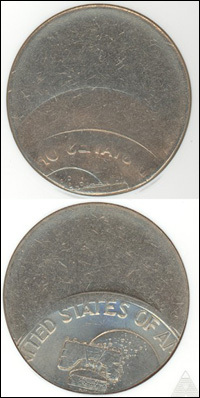 One of the most thrilling aspects of collecting error coins is the hunt, more precisely, the successful hunt. My purchase of the coin illustrated shows how two and a half years of patience and persistence can pay off. About six years ago, a friend told me that an acquaintance of his told him that Mr. X at Dealer Y’s bourse table at the FUN Show in Orlando had an interesting Ike Dollar error. I went over to Dealer Y’s table and asked for Mr. X. He wasn’t there, but they said he’d be back later. I visited that table four or five times during the show before we finally met. Mr. X said he did have what he thought was a very rare and unusual Ike error at home. I learned it was a partial brockage error he might be interested in selling. He offered to bring it to the ANA Show if I was interested. I tried to talk him into sending a picture, but he said he wasn’t very good at taking pictures of coins. I looked him up again at the ANA Show (I only go to two major shows a year), and he said that he had decided not to sell the coin. After some discussion, he said he would bring it to the next FUN Show and at least let me see the coin. He said he didn’t really collect error coins, but this one was special and he thought I’d get a kick out of seeing it. Well, you guessed it...when I got to the FUN Show he said he had been really busy just before the show and didn’t have time to dig the coin out. He promised to bring it to the next ANA Show, but he also reminded me it wasn’t for sale. Unfortunately, I wasn’t able to attend the ANA Show because something came up at work at the last minute. At the next FUN Show, he told me he remembered to bring it to the ANA Show but didn’t bring it to this show. I then saw him at the next ANA Show, he surprisingly had the coin with him and implied he might consider selling it. He mentioned that someone else was also very interested in the coin, but he thought he had an obligation to at least let me see it. I was really surprised and delighted as the coin was not only a partial brockage error, it was a bicentennial (1976) Ike that was struck by the reverse die about 50% off center. 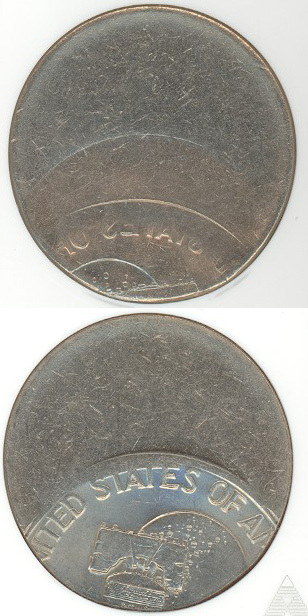 In addition, on the obverse was a brockage impression from the reverse side of another Ike Dollar that was struck 20% off center. WOW! What a great and rare error! It was difficult to rein in my excitement. I purchased it immediately. The rest of the show, I participated in another fun aspect of the hobby, that is, “Show & Tell” as I couldn’t hold in my glee any longer. Error dealers and fellow collectors alike were impressed by my luck in finding this superb error and congratulated me on my persistence. I knew the coin was great as I hadn’t seen an Ike with a brockage before. I didn’t know how hard it would be to find more partial brockages from a coin that was struck off center, but I’ve since picked up a few. I still need a dime with a brockage from a previously struck off-center dime. If you have one for sale (or anything else that’s spectacular), feel free to send me an e-mail. It sure is fun collecting error coins since they are so different and sometimes even unique. You never know what you’ll find. I hope that all of the collectors searching for mint errors are enjoying the hunt and having great success. Copyright Ⓒ 2003 minterrornews.com. All rights reserved. Legal notice.